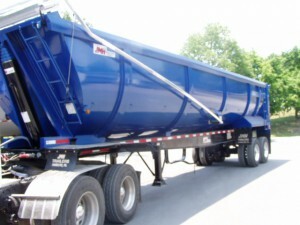 Steel and Aluminum Dump Trailers. 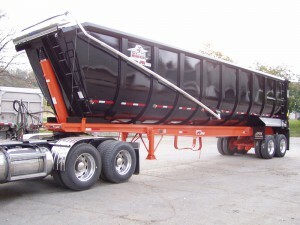 JMH Trailers specializes in the manufacture of steel dump trailers engineered specifically for the tough demands of the scrap hauling industry. 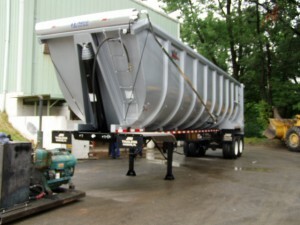 After 50 years of steel trailer manufacturing, we know what lasts and what doesn’t. 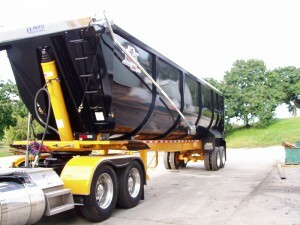 …there is only one JMH Trailers Inc. and we are the best at what we do! 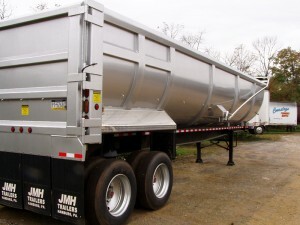 JMH Trailers, Inc. would like to introduce our new products for 2016! Click the images below to view slideshow! 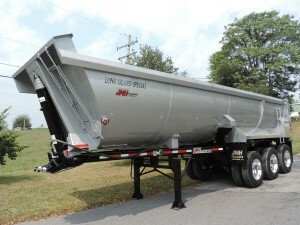 For over 50 years of building these trailers specifically for demolition companies, JMH is now offering “The Demolition Demon” dump trailer. 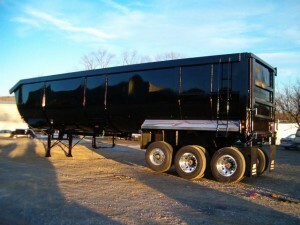 The “Demolition Demon” trailer base specs are: 47 cubic yards capacity, 34′ length and 70″ sides (for easier loading in tighter job sites), framed I beam, 3/16th or 1/4 Hardox 450 floor and sides, single-point suspension, “4 On-The-Floor” dumping and steel wheels with other additional options available. 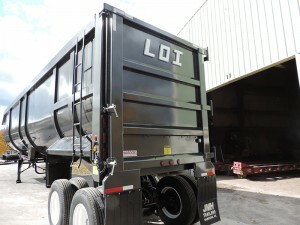 Custom built to your needs in nearly any length from 22′ to 40′, sides up to 94″, multiple weight and axle configuration options including a 3rd fixed or steering axle, ABS, steel or aluminum wheels coupled with innovative safety features like “4 On-The-Floor” dumping. 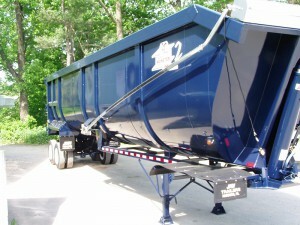 JMH Trailers has the right trailer for your hauling needs. 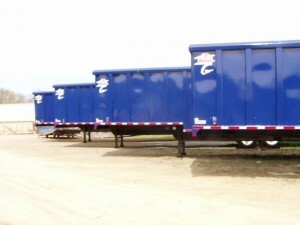 “Four-On-The-Floor” dumping: All four rear wheels of the Monster 1 steel dump trailer remain on the ground throughout the entire dump process. 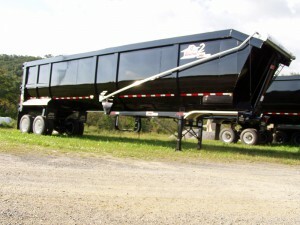 This results in unparalleled stability over traditional steel dump trailers that only keep one axle on the ground while dumping. Click the images below to view slideshow! 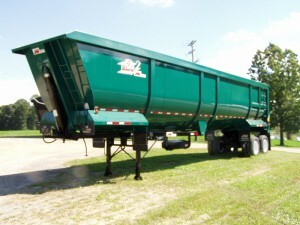 The Dump Trailer That Started It All! 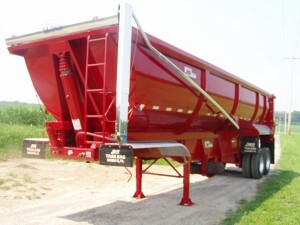 Over 50 years ago this round body trailer was created to handle the demand for super heavy duty dump trailers. 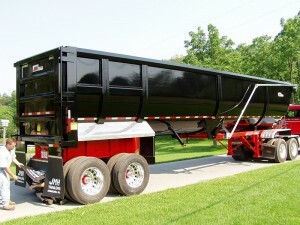 The Monster 1 is available Framed or Frameless, has a base length of 40′ with 94″ sides is hand crafted from HardOx 450 Steel, uses the industries best components and has a long list of standard features. 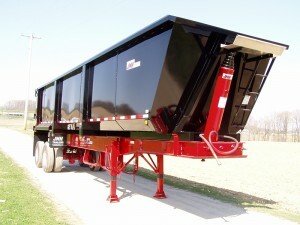 The Monster 1 can be custom built to your specs to handle virtually any application. 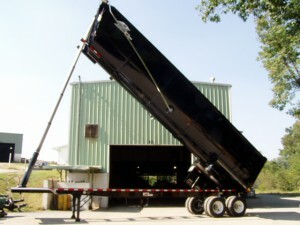 “Four-on-the-Floor” Dumping: All four rear wheels of the Monster 1 steel dump trailer remain on the ground throughout the entire dump process giving the Monster 1 unparalleled stability over traditional steel dump trailers that only keep one axle on the ground while dumping. 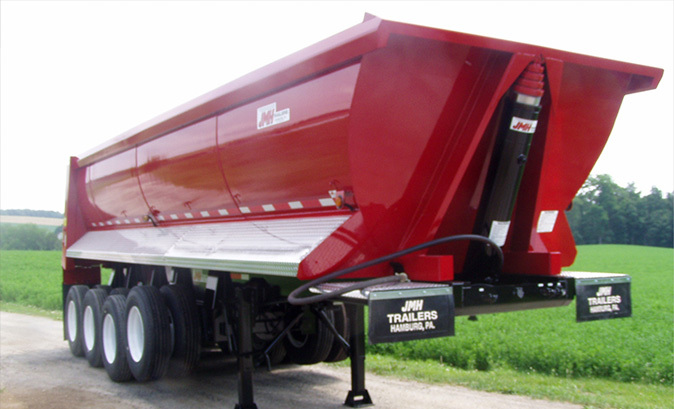 JMH leads the industry with dump trailer gate features such as the JMH 2 Way Gate, allowing both standard and barn door dumping with ease. 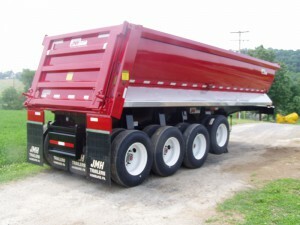 The JMH Trailers Air Gate was created to decrease drag in air flow and offers easy one man operation while retaining legendary JMH Trailers durability. Click the images below to view slideshow! 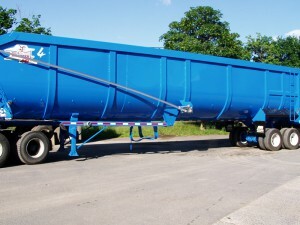 40′ (78 cu. yds.) or More! 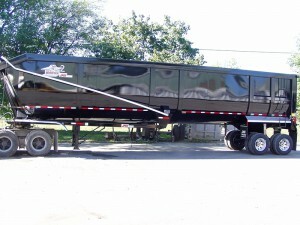 Built To Your Specs! 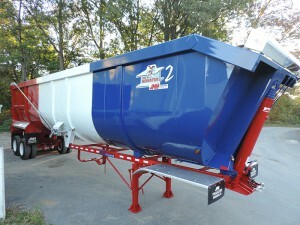 The Monster 2 is the one of the most popular heavy duty trailers from JMH Trailers. 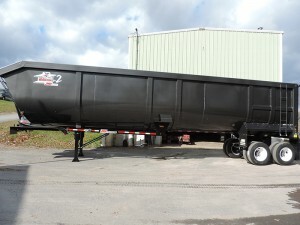 With a 90+ cubic yard capacity it is one of the largest steel dump trailers in the world! 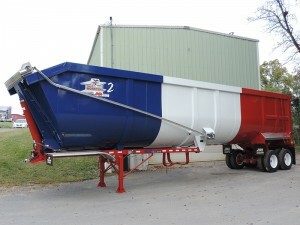 The Monster 2 reaches new levels of hauling capacity, efficiency and safety typically unavailable in the steel dump trailer market place. 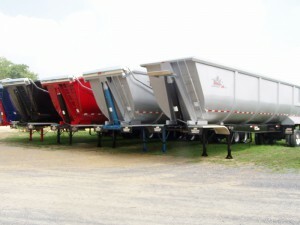 “Four-On-The-Floor” dumping: All four rear wheels of the Monster 2 steel dump trailer remain on the ground throughout the entire dump process giving the Monster 2 unparalleled stability over traditional steel dump trailers that only keep one axle on the ground while dumping. 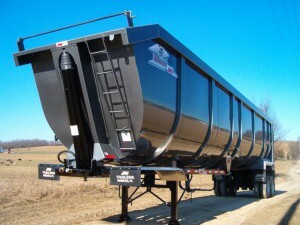 The JMH Air Flow Tailgate was created to decrease drag in air flow and offers easy one man operation while retaining legendary JMH Trailer’s durability. Click the images below to view slideshow! 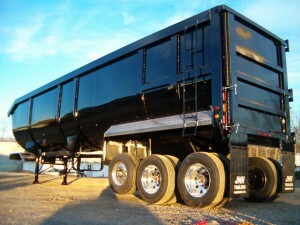 Originally made for New York State haulers, the Monster 3 is a Monster 2, Framed or Frameless, with a third steering axle, custom built to your specs to comply with weight and hauling limits for your state or country. 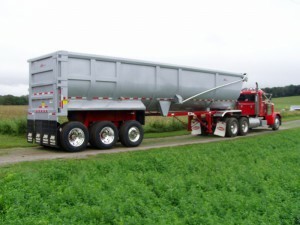 The Steerable Axle Suspension from Watson & Chalin on the Monster 3 Steel Semi Dump Trailer means the ground wheels steer into the turn greatly reducing pavement scuffing and significantly improves tire and axle life because of the lessened skid force. 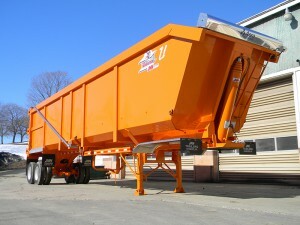 New York Monster 3: A Monster 2 with a third steering axle, built to comply with New York State D.O.T. Laws. 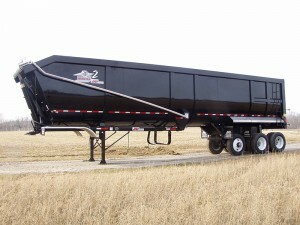 Canadian Monster 3: A Monster 2 with a third steering axle, built to comply with Canadian Laws. 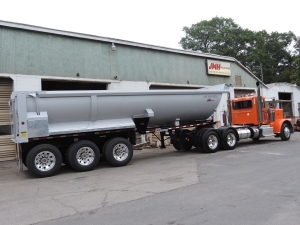 JMH also builds 3rd and 4th axle trailers spaced to the needed specs you need to legally haul maximum capacities safely and efficiently. 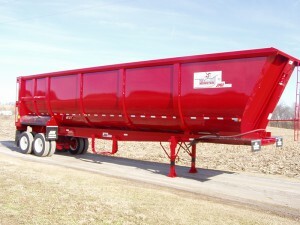 JMH Quad Axle Trailers: Four axle trailers, custom built to your specs that will comply with weight ratings& local laws. 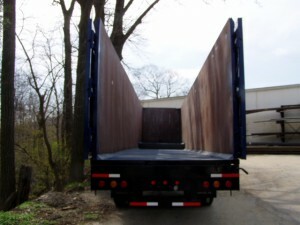 “Four-on-the-Floor” dumping: The Monster 3 is available with “Four-on-the-Floor” dumping with frameless or All-on-the-Floor in a framed version. 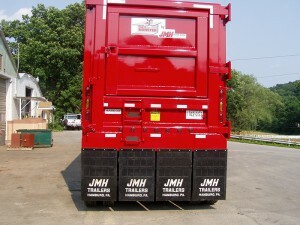 The JMH Air Flow Tailgate was created to decrease drag in air flow and offers easy one man operation while retaining legendary JMH Trailers durability. Click the images below to view slideshow! 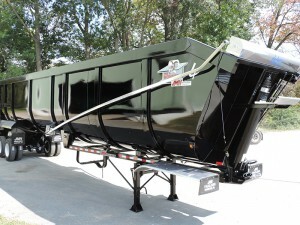 The Monster 4 is the latest steel dump trailer from JMH Trailers that utilizes HardOx 450 Steel creating a lighter weight without sacrificing durability. 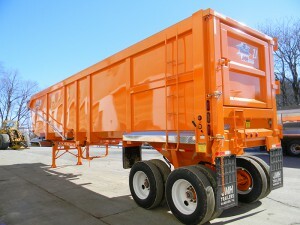 With a 97+ cubic yard capacity it is quite possibly the largest street legal steel dump trailer in the world! 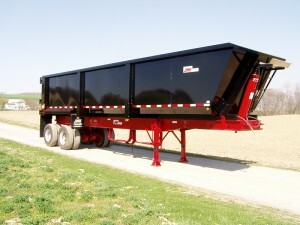 The Monster 4 takes hauling capacity to another level of profit, efficiency and safety! 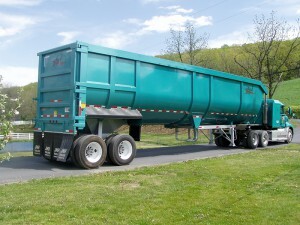 “Four-on-the-Floor” dumping: The Monster 4 is available with “Four-on-the-Floor” dumping with frameless or All-on-the-Floor in a framed version. 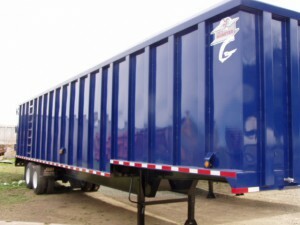 The Monster G is a heavy duty steel Gondola Trailer, non-dumping, from JMH Trailers. 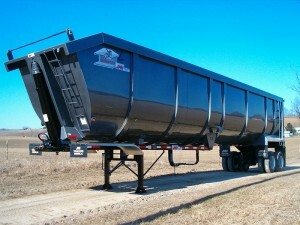 With a 100+ cubic yard capacity it is one of the best engineered steel Gondola trailers in the world! 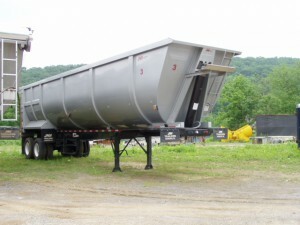 The Monster G reaches new levels of hauling capacity, efficiency and safety typically unavailable in the steel Gondola trailer market place. 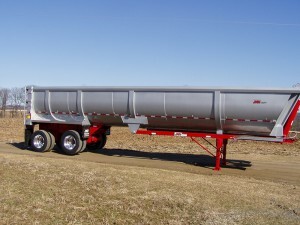 Dropped Suspension Design Means Larger Payloads with a Lower Center of Gravity. 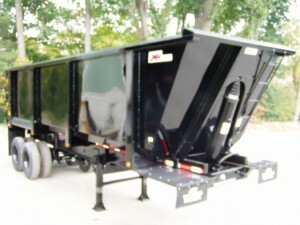 This Trailer Design Delivers Increased Stability with Larger Loads Without Sacrificing Safety! 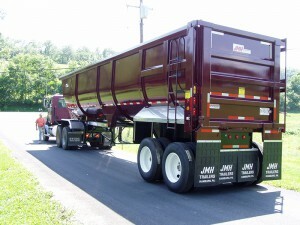 JMH Trailers Inc., renowned innovators in the truck and trailer industry for over 50 years, JMH Trailers has built their reputation on manufacturing some of the toughest longest lasting heavy duty trailers in the world. 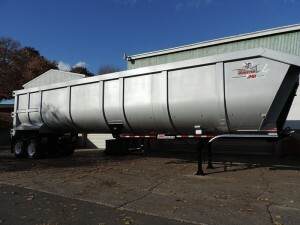 Some of their original steel trailers are still on the road after 50 years! 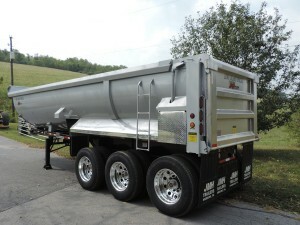 Click the images below to view slideshow! 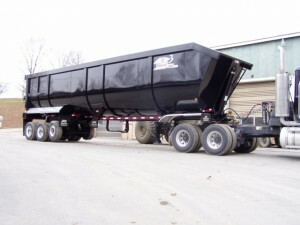 A long list of standard features include a 90+ yards payload capacity at 42’ with 94” side height, the JMH Monster U Body Dump Trailer is quite possibly the world’s most durable trailer of it’s kind offering the ease of drive on forklift loading and unloading as well as traditional dumping applications. 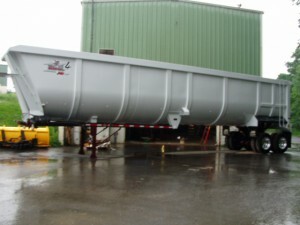 The U Body comes standard as a frameless steel trailer, (Framed Also Available) precision engineered and constructed of 450 Hardox Steel for the 3/16th thick floor, 90 degree rear and sloped front and 3/16th” thick Hardox steel for the 5 ribbed sides. 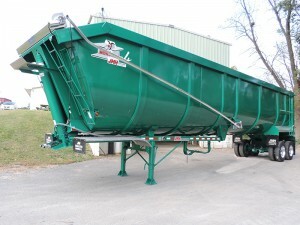 This incredible steel trailer features “4 on the floor” dumping capabilities which means both 102” 25,000 lb. 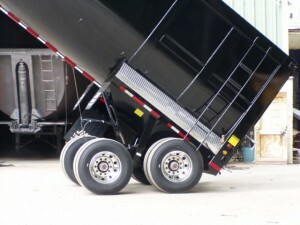 rear axles and wheels remain on the ground during the entire dump process, with the rear axle ABS equipped. 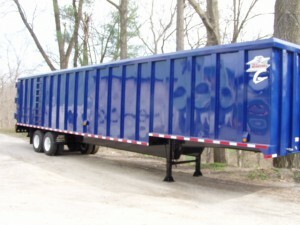 The four on the floor feature delivers increased safety and stability. 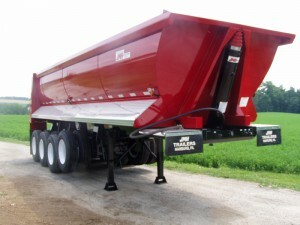 Watson and Chalin provide the single point suspension on the U Body assuring long-term load stability. 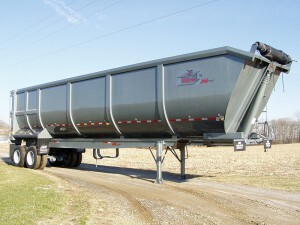 Other features include a Heavy-duty top rail, barn-door with w/ skid plate, is standard with air flow gate option available and top of the line Aero electric tarp system. 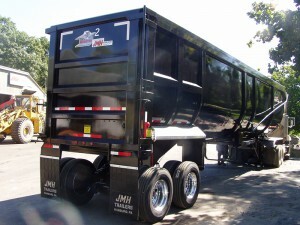 The JMH U Body comes with a long list of standard features and custom options consisting of the industry best components. 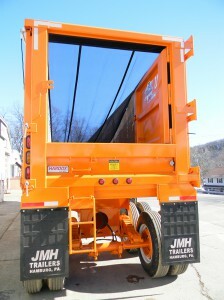 The JMH Trailers U Body is sure to make another serious impact in the heavy hauling industry. Click the images below to view slideshow!